More than 15 million dogs in North America suffer some form of degenerative joint disease, better known as arthritis. Unfortunately, many dog owners are unaware of the pain their pet is experiencing, chalking up the slow movement to the effects of "old age." Some dogs may receive daily doses of pain relievers and oral joint care supplements. Still others might find their way to physical therapy or rehabilitation. Some lucky pets even get ramps built in their homes, sparing them the need to climb the dreaded stairs! But for some, any or all of these options are not enough to relieve the pain. But a potentially helpful treatment may be on the horizon called stem cell therapy. Vet-Stem, a company focused on bringing regenerative medicine technology to veterinarians, has developed a therapy to treat arthritis in dogs using the pet's own fat tissue! Stem cells are precursor cells that have the potential to develop into a variety of specialized cell types. Most people may equate this technology with the controversial use of embryonic stem cells. But this new technology uses adult stem cells derived from the fat of the pet. Since they are the pet's own cells, there is no ethical debate! Vet-Stem developed this technology from research and techniques used in equine medicine. Scientific and anecdotal evidence from more than 2,500 horses establishes that these fat derived stem cells are quite helpful for tendon and ligament injuries. Furthermore, no significant side effects were reported. Stem cells appear to moderate the inflammatory response and actually create a healthier healing environment in the joint. Recently, a detailed study on the use of fat-derived stem cells in dogs showed that animals receiving the treatment demonstrated a significant improvement in lameness when compared to dogs in the control group. This news has excited scientists and pet owners alike and has many asking their veterinarians about the potential for a real world application. Participating veterinarians can harvest a small fat sample from the pet and then send the sample priority overnight to Vet-Stem's laboratory in San Diego, California. Technicians then process the tissue to concentrate and purify the stem cells. The cells are returned to the veterinarian, ready to be injected into the pet just 48 hours after collection. All of this seems pretty miraculous and for some pets, the results are truly nothing short of a life-saving miracle. Many veterinarians are skeptical though and would like to see more controlled studies. It is also important to note several obstacles may stand in the way of a pet's pain relief. First, not all pets are considered good candidates for this therapy. Since anesthesia is involved in both the harvesting step and the reintroduction of the cells, this may not be ideal for patients at increased risk for anesthetics. Additionally, according to Dr. Bob Harman, CEO of Vet-Stem, any dog with serious systemic disease, such as cancer, might not benefit from these treatments. Arthritis can be painful and even debilitating in any dog. If you suspect your dog suffers from this disease, talk with your veterinarian about testing to confirm arthritis and then discuss the many treatment options. Veterinarians may recommend a multi-modal approach, combining appropriate medications, controlled exercise, weight loss, and environmental changes to make your pet's life easier. In some cases, new technology, like stem cell therapy, might be beneficial. Arthritis is not disease that can be cured, only managed. Many veterinarians recommend pain relievers, joint supplements, careful exercise and weight control. A new technology, stem cell therapy, may pave the way to save some of these dogs from early euthanasia. Stem cells are cells that can become any type of cell in the body. Removing a small amount of a pet's belly fat, a veterinarian can have the fat purified at a laboratory and the stem cells sent back for injection in the pet's arthritic joint. The stem cells help to promote a healing environment in the joint and reduce the inflammation that lead to pain. Many pet owners and veterinarians are happy with this therapy's results, but this treatment is not for all pets. 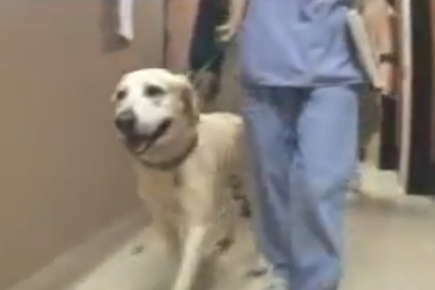 The cost of the treatment is also an obstacle for some pet owners. Talk with your veterinarian about steps you can take to help minimize the effects of arthritis on your dog and how to keep him comfortable.